The Netflix disaster after the close could trip up the entire market. The S&P gains since January have been produced by only five stocks. Five big cap Nasdaq stocks have supplied 91% of the gains on the S&P. This is extremely narrow market breadth and very dangerous. Since January 1st, Amazon was responsible for 35% of the S&P gains, Netflix 21%, Microsoft 15%, Apple 12% and Facebook 8%. A healthy market advances by a strong ratio of advancers to decliners. 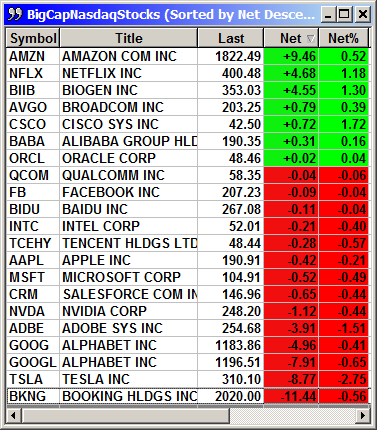 The S&P has 500 stocks and a positive market should see 65% or more on average that are rising every day. In 2018, that ratio on average has been around 50%. That means 50% of stocks are rising and 50% are declining on average. This means there is a lack of conviction by both buyers and sellers. 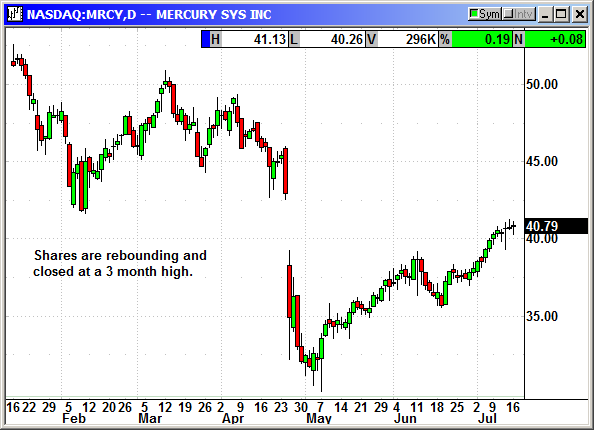 There are exceptions where a headline sends the indexes into a tailspin and decliners are in the 75% to 80% range. In theory, market technicians want to see that 65% or better ratio of advancers over decliners in order to feel comfortable with a market rally. The problem with the majority of gains coming from only five stocks is that we are dependent on continued gains in those stocks for the market to move higher. 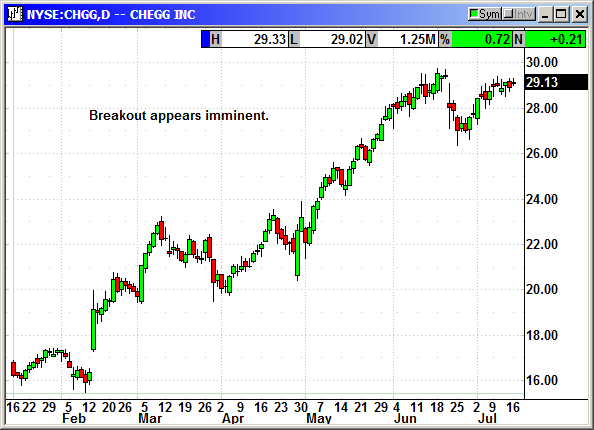 If something should happen to those five market leaders, the market is likely to decline due to lack of market breadth. Today Netflix reported earnings that disappointed the street and the stock declined $57 dollars in afterhours trading. That is a 14.25% decline in just a couple hours and there is a strong chance the decline could continue. Before today, Netflix was up 108% for the year from $192 to $400 with recent analyst price targets as high as $500. When a star performer like Netflix posts a significant disappointment, it changes investor sentiment for the stock. Everyone that was wildly bullish before is forced to rethink their position. 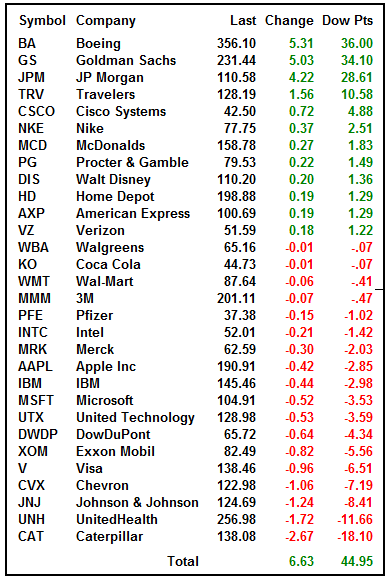 Investors that had held all year just saw 25% of their gains disappear in just a couple hours. There will be some who will buy the initial dip but there will be others making the decision to take their remaining profit and run. With Netflix one of the big five gainers for the year, the earnings disaster could force investors to reconsider their positions in those other four stocks. If these leaders suddenly become laggards, even if it was only a minor weakness, it could impact sentiment all across the tech sector. Investors should always look for positive market breadth as a leading sentiment indicator along with better than average volume. Analysts claim volume is a weapon of the bulls and weak volume along with narrow breadth signifies a weak market even if it is posting gains. Volume has been relatively weak and breadth has been terrible. Everyone continues to pin their hopes on the 21-24% earnings expectations for Q2. That is a strong tailwind for stocks but there are still some roadblocks in our future. Now that the Russian summit and the NATO meeting are behind us, President Trump will come home and more than likely return to tweeting about the Chinese trade issues. Investors have glazed over to some extent after weeks of increasing rhetoric but that does not mean they cannot be shocked out of their earnings trance by some sudden tweet. We are facing significant risk in August and September from tariff issues and those are already the two worst months of the year for the market. 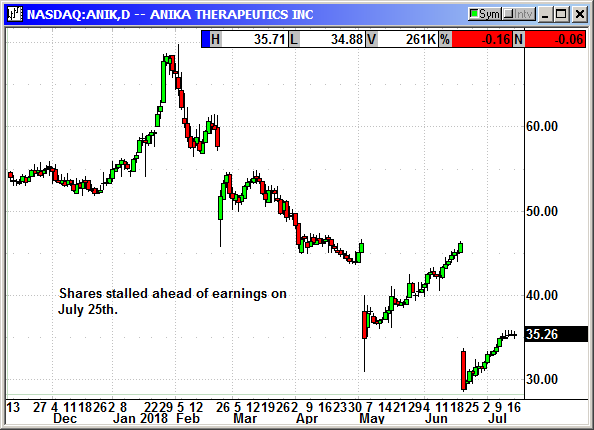 We should gratefully accept any further gains in July then prepare for some exits in early August. 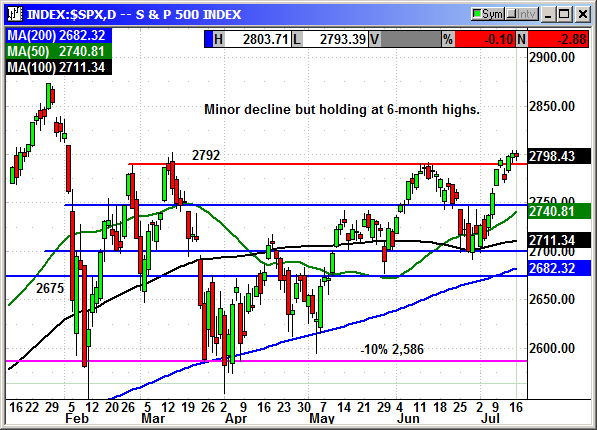 The S&P could not hold over 2,800 but only posted a -2.88 loss. That is just noise at this level. Friday was a six-month high. The index is still in breakout mode but it could face some challenges on Tuesday if those five tech leaders become laggards. The Dow was helped significantly by a big gain in Boeing and the two banks. Goldman has earnings on Tuesday and JPM was on Friday. Goldman was up on news they were replacing Lloyd Blankfein as CEO. Boeing was up sharply after announcing $4.7 billion in new orders at the Farnborough International Air Show. There will be further orders announced. DHL placed an order for 14 777 freighters and options for seven more. 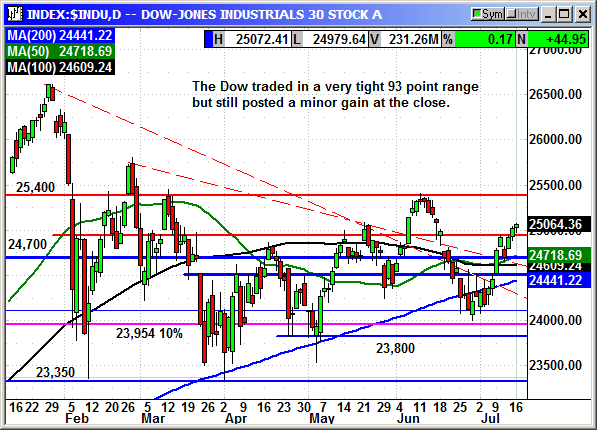 The Dow will not have those same boosts on Tuesday and support at 25,000 is likely to be tested. 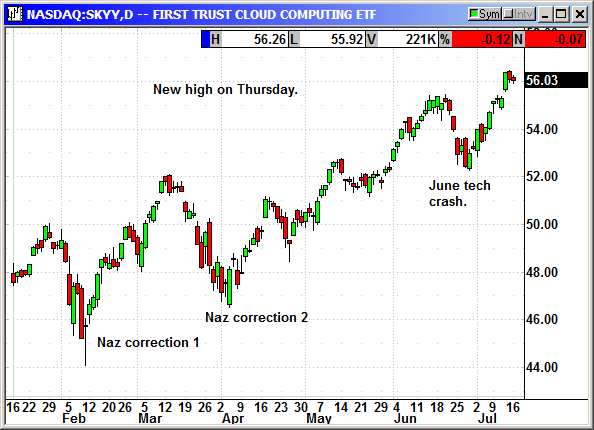 The Nasdaq posted a minor loss of 20 points but it will start out in the negative on Tuesday. The Nasdaq futures are trading about 50 points below their 4:PM close. 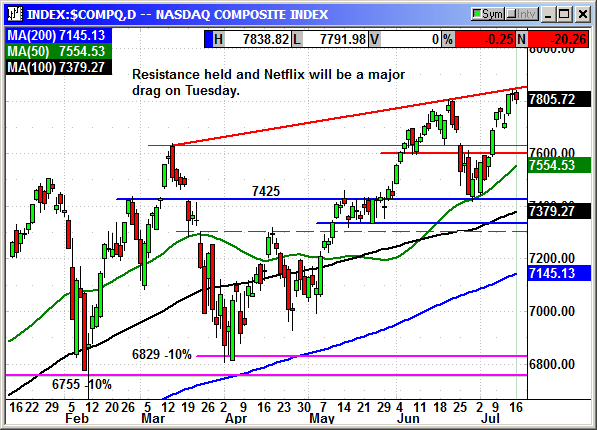 If Netflix poisons sentiment for the FANG stocks, we could see a sharp decline at the open. 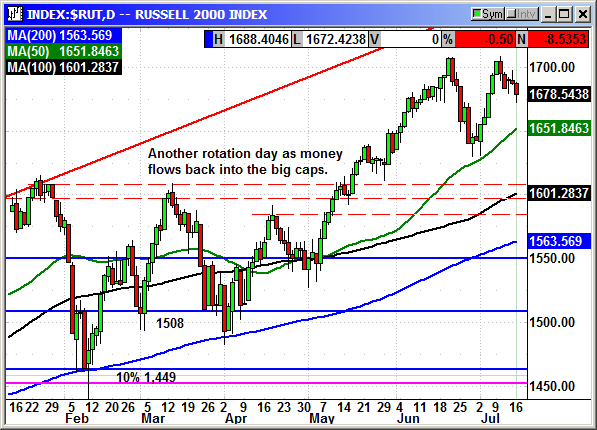 The Russell continues to be hurt by rotation back into the big caps. 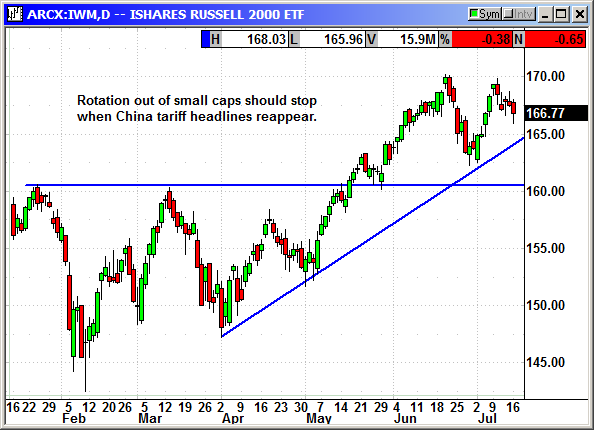 This will end immediately once the China headlines come back into focus. The earnings pick up the pace this week with three Dow components reporting on Tuesday. Those are GS, JNJ and UNH. This week is a tease. Next week is a flood. 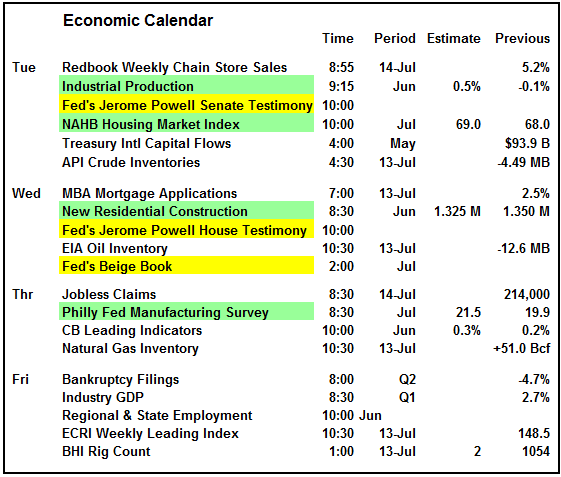 The calendar is headlined by the back-to-back testimony by Fed Chairman Jerome Powell. He will be the main attraction if there are no tweet storms. I would expect a dip at the open. The S&P futures are up about 2.50 tonight but the closer we get to morning the more likely to decline. I would let the initial dip run its course and look to buy the dip for a short-term trade around 10-10:30 but only IF it appears to have run its course. Watch the FANG stocks for direction. If they turn positive, the coast is clear. 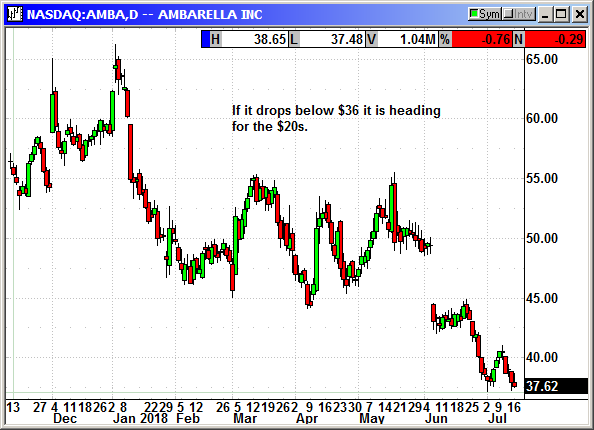 Buy Nov $35 put, currently $2.70, stop loss $41.25. We will exit in September or earlier. No specific news. Shares holding just under new highs. 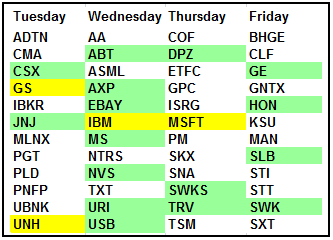 We have seen four minor declines in the last five days as money rotates out of the small caps and back into the big cap international stocks. Rumors of a potential trade deal continue to circulate despite Treasury Secretary Mnuchin saying negotiations have failed. The instant headlines begin to appear, the rotation should stop and even reverse. 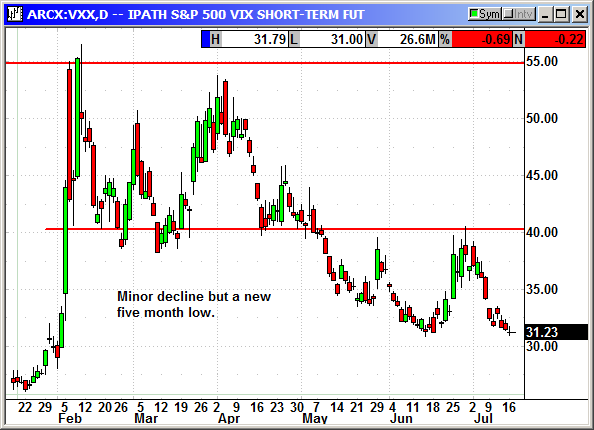 The VXX continues to decline and closed at a new five month low.